- Search or filter nearby lunches base on your current location or the specific location and other criteria you give. - Switch between list view and map view to see lunch results. - View the lunch details like restaurant name, Yelp rating, address and even photos and contact phone number. - View restaurant details and choose add event, add to favorites or recommend the restaurant to others. - Request to join the lunch that initiated by other user and get accepted by the organizer. - Add a lunch and invite your friends to join. 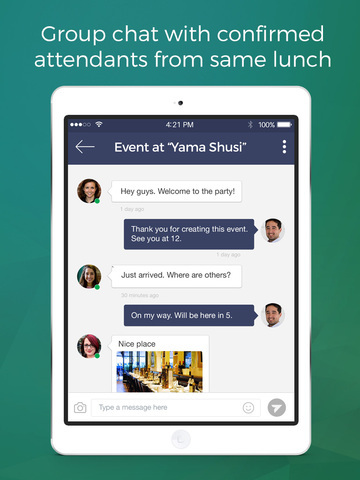 - Send message to your friends or group chat within lunch attendants. - Add user to friends or favorite. - View your scheduled or past lunches. 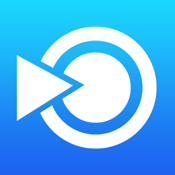 - Notification center that ensure you won't miss any update on lunch request or friend request. 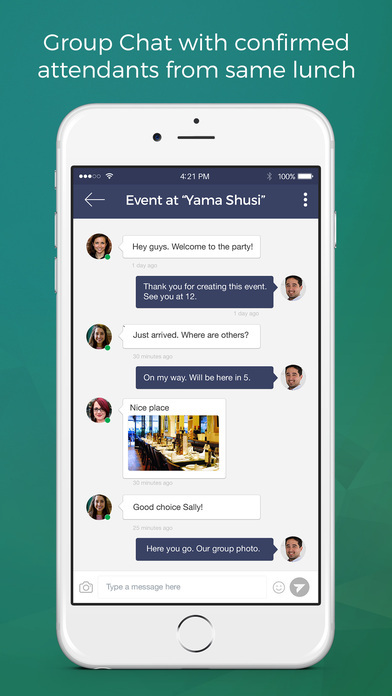 - Message center is where you can see all your chat history. - Earn points by posting lunch, approve other's request, when your request approved by organizer, add a friend, check in a lunch, mark your lunch end. - In case you can't decide where to go today, check out our "Featured" tab to find some clue. - We want to recommend restaurants that you and others really like them. So recommend the restaurant to us if you like it and we will contact restaurant owner to get promotion for all our users. Although we chose the name as "Lunch Buddy", you can still use this app to invite friends for dinner, happy hour and so on. The reason why we only allow sign in with LinkedIn is to ensure that there is no anonymous users and people you are going to meet is nearby professional. Our introduction website is http://lunchbuddy.zcoder.io. We'd like to hear your feedback. Email your observations or suggestions to lunchbuddy@findlunchbuddy.com. We will make every effort to improve it. Finally, explore the app and have fun.